This is a beautiful example of the 1842 Society for the Diffusion of Useful Knowledge or S.D.U.K. 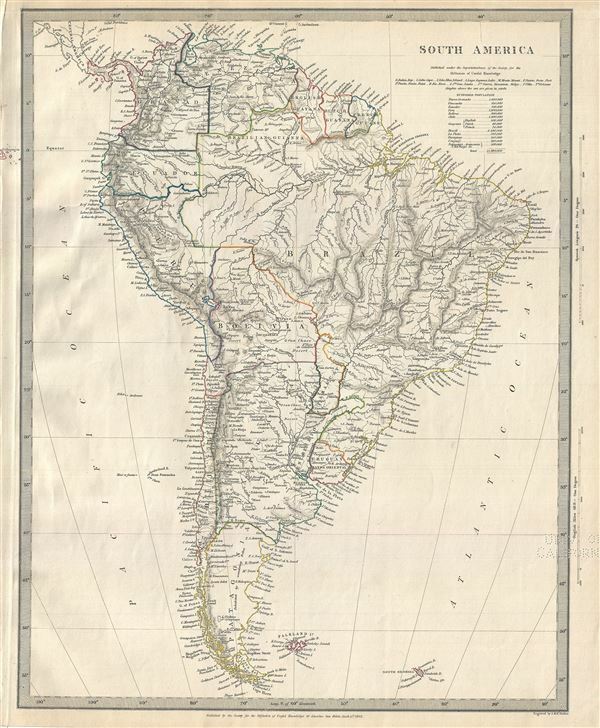 map of South America. It covers the entire continent from the Caribbean to Tierra del Fuego and from the Pacific to the Atlantic, including the Falkland Islands. Depicts the continent in impressive detail – especially the interior, which at the time was largely unknown. Throughout, the map identifies various cities, towns, rivers, mountain passes and an assortment of additional topographical details. Bolivia's claims to the Atacama Desert and Peru's claims to the Tarapaca region - both of which are today part of Chile, are shown. Rumsey 0890.146. Phillips (Atlases) 794.